When it comes to privacy, Apple is perhaps the most active and well known operating system at that. That is precisely why the iPhone backups created are encrypted with an iPhone backup password in iTunes. This ensures that the data in your backup is safe and secure behind a password firewall. But, what if you want to view this encrypted backup and have no access to the password? How will you be able to views encrypted iPhone backup? We will guide you through different ways this can be achieved. Part 2: What If I Forgot the iTunes Backup Password? Part 3: How to Remove the Backup Encryption Settings? The major issue with the iTunes based iPhone backup is you will not be able to view encrypted iPhone backup just by accessing it. If you do not have access to the password, you will not be able to view it as such. 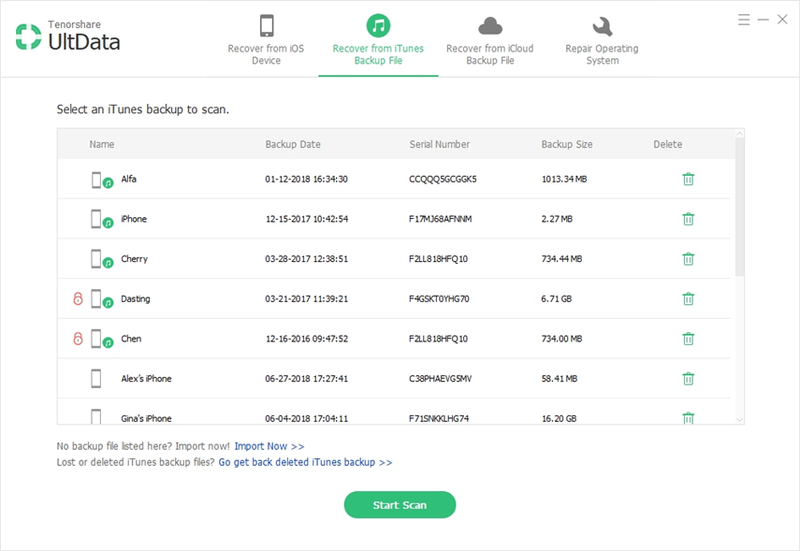 You will need to restore the entire backup on an iPhone, and you will be able to view the encrypted iPhone backup. If you have not restored an iPhone backup before, the following guide should help you do it quickly. After that, connect your iPhone to your computer and launch iTunes on your device. If you have done everything right, iTunes should detect your device. You will be shown all the backups available on your computer. Choose the backup you want to restore and click on it. Then hit the Restore button. Wait patiently till the process is completed and your iPhone is restored with the backup you have selected. Please note that you will need to have access to your iPhone backup password for accessing the restore functionality. Enter it when prompted to continue with the restore process. This is how to view encrypted iPhone backup files. This method can have a few disadvantages. You need to have your password for the restore operation. Moreover, it will restore all the content on your phone and remove the content already available. If you have forgotten your password, it may not be easy to view or restore the backup. Whether you want to restore your encrypted iPhone backup or view it, you will need the iPhone backup password that has been configured initially. It may so happen that you may have forgotten the password or do not know it. In such circumstances, a tool like Tenorshare iBacupUnlocker works like a charm in helping you recover your password. Step 1 Install and launch it on your computer. Choose the encrypted backup file on your computer that you are trying to find the password for. Then select the option Retrieve iTunes backup password option. Step 2You will find all the backups saved on your computer displayed. Choose the backup that you want the find the password for. This can also be the backup you are looking to restore a particular backup and have no access to the password. Step 3Next step will be to choose the recovery mode you want to employ. Tenorshare offers you three different options for recovering the password. Step 4Once the attack mode is decided and opted for, click on Start. Wait patiently till the password is recovered. The time taken for the completion of the task will be dependent upon the difficulty of the password and the attack type you have chosen. Step 5Once the password is detected, the tool will let you know the password. You can use the password to view encrypted iPhone backup on iTunes by restoring it, or through any other options, you may deem fit. Tenorshare iPhone backup unlocker has recently introduced a few new features. 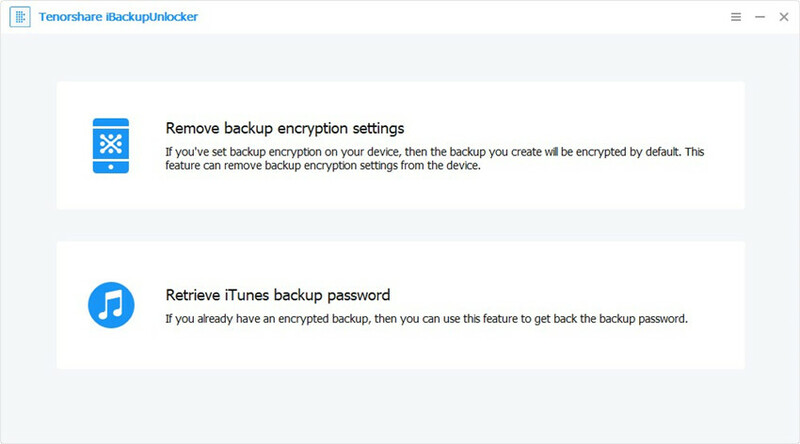 One of the features so introduced include the option to Remove the Backup Encryption Settings. How will we use the feature? Here is the guide you help you out in that perspective. Step 1Launch Tenorshare 4uKey - iTunes Backup on your computer. From the main interface, click on Remove Backup Encryption Settings option. Step 2Connect your iPhone for which you want to remove the password option for. Once the iPhone is detected by Tenorshare, you will get a confirmation prompt. Step 3The START button should be enabled as soon as your phone is detected by the tool. Click on it to begin removing the password. 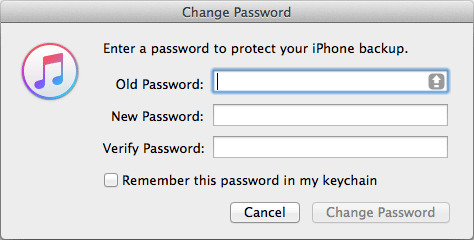 Wait patiently till the software removes the iPhone encrypted backup password from your iPhone configuration. Then you will get a confirmation prompt as soon as the password is removed. That does it. You have successfully removed the iPhone encrypted backup password, and as such you will not need to remember the password. In essence, this will mean your future iPhone backups from the iPhone will not be encrypted. Well, those were the best options you can use for recovering your password to view encrypted iPhone backup or removing the iPhone backup settings on your iPhone. Please note that the password is an important aspect for securing the privacy and security of your iPhone backup. The above method for removing the password or the disabling the encryption completely may not be advisable. We would suggest opting for it only when you have forgotten the password and want to retrieve it.